while I was at a poker run rest and card stop. convenience stores at Lexington, or Hiway 9 and 72 junction. Wouxun connector to BNC. Radio is the 144/223 MHz version. are programmed in memories 121 through 127. 146.985 is in memory 128. That should be enough to peg the radio if it shows up. No charger was with the HT. The Rig Register and RepeaterBook have stolen equipment databases. Will you be attending this #ARRL #hamradio event? Set up Friday Afternoon (1:30 P.M.)until 9:00 P.M.
permission to activate the Memorial. At this time, the primary concern is no activations of any type 15-30 April. Center due to very limited space. Mobile activations are only allowed on Saturday and/or Sunday. The OKC Memorial Marathon event hosts over 25,000 runners and walkers from every state and several foreign countries. The Mission of the Oklahoma City Memorial Marathon is to celebrate life, reach for the future, honor the memories of those who were killed and unite the world in hope. The Memorial Marathon Public Safety Comm. Chairman is seeking amateur radio volunteers to facilitate in the safety and care of the participants as a 2 meter amateur radio handheld/mobile operator at the numerous medical stations, relay exchanges, start/finish line, etc. This is not an emergency drill - it's a unique 26 mile opportunity to help people who are injured, lost, or otherwise in need and to exhibit your emergency communications abilities! New volunteers will be paired up with veteran volunteer radio operators. Time: Most radio operators may need to be at their stations by 6:00 A.M. Operators may close down their station once the runners have past. The event is generally over by 3:00 PM. More information will be provided once your assigned to a location. The pre-briefs and t-shirt pick-up will be held Tuesday April 19 at the OKC Fire Training Center at 820 N Portland. A make-up pre-brief is also scheduled for Saturday April 23. An e-mail will be sent by the safety coordinator regarding the time of day. It's a lot of fun - and 25,000 runners and walkers are extremely grateful for you! 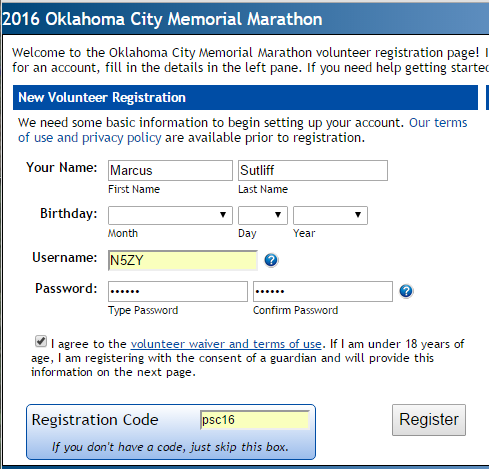 NOTE that the 2016 radio operator volunteer registration has changed from last year's registration – so please use the button above! Make a new login and password, we suggest you use your call sign. Fill out your name, birthday, username, password and check to agree to the waiver. Then type in psc16 in the "Registration Code" box at the bottom. Click Register. Using the "psc16" code automatically puts you in the Public Safety Communication database. Next, please enter all the appropriate contact information. At the very bottom is a box for you to enter your callsign! It's easy to overlook! If you are a spouse/friend and not licensed but working with the licensed person, enter "spouse of (call sign)" or "working with (call sign" or something similar. When the 'committee preference' menus are presented just skip by that selection. You can also skip the schedule of availability since we pretty much just do the whole thing on Sunday Apr. 24 (0600 to about 1500). For previous experience please indicate if your have volunteered for this event before and where - or if it's your first time. Enter your t-shirt size and you are done. The 2016 shirts should be red colored. The third annual Civilian Conservation Corps On-The-Air weekend will be held the second full weekend in August, 2016 between Saturday at 14:00z (10:00am EDT) and Sunday 21:00z (5:00 pm EDT). The Civilian Conservation Corps came into being in the spring of 1933. Its goal was twofold: to provide needed economic relief to families suffering from the effects of the Great Depression and to protect and develop the natural resources of the United States. CCC Amateur Radio Operators strive to honor the contribution that "The Boys" of the Corps made to our country and to our natural environment. As radio played a big part in how the camps communicated with each other, our goal is to put the sites of the CCC camps back on the air. "We would encourage you to activate the actual location of one of the camps" If it is no longer accessible or you cannot get permission to set up on the site, you may operate from one of the project sites the camp produced. Many state local parks have buildings that were constructed by the "CCC Boys" and would make a suitable place to not only honor them but also promote amateur radio at the same time. For more information see our website www.qsl.net/ccc or contact KG8JK via email: ccc@qsl.net . Thanks to Dirk, KG8JK for this report. The ARRL now has a newly-signed Memorandum of Understanding (MOU) with the American National Red Cross. Section Manager or the Section Emergency Coordinator may sign this local agreement on behalf of the ARRL Section, ARES unit or local radio club. The local Red Cross regional leader or chapter leader would also sign on behalf of the local Red Cross organization. 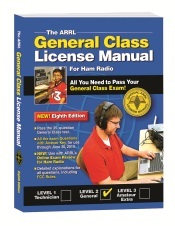 ARRL Headquarters and the American National Red Cross Headquarters are very interested in having copies of these local statements of cooperation that are signed for the first time or are renewed. Please share with all your ham friends and fellow ham club members. Get on the HF bands and talk to people around the world with a Single Sideband Radio and a indoor attic wire antenna! Celebrate the centennial celebration of our national parks by logging a contact with each special event station at each national park! Oklahoma (Oklahoma City)---- July 22; Friday, 3:00 - 7:00 PM and Saturday July 23, 8:00 AM - 3:00 PM. are the dates set for Ham Holiday, sponsored by the Central Oklahoma Radio Amateurs, Inc.
Technical and nontechnical programs, DXCC /WAS card check, VE testing, flea market. Adm: Preregistration $8; at door $10; flea market $15/table in advance; $20/table at door (if available). Online registration available beginning 15 March!! Under 16 yrs of age free with paid adult. In-house Announcements on 146.49 Mhz simplex. Friday evening banquet tickets available at online registration. Vendors, contact vicepresident@hamholiday.org for details. See the CORA webpage (http://hamholiday.org http://hamholiday.org/) for preregistration information.